Featuring "Fast Horses & Good Hideouts," "Denim & Diamonds" and "D.R.U.N.K." Ever the outlaw, Shooter Jennings has now crafted what might well be his most truly idiosyncratic work thus far, Shooter. Produced by longtime friend and collaborator, Low Country Sound founder Dave Cobb, at the renowned RCA Studio A on Nashville's Music Row, the album sees Jennings staking out a fairly straightforward goal: to simply make a great country record. It should be noted, Jennings' last studio album was a genuinely visionary tribute to Giorgio Moroder so in some ways, making a straight up country record is as much of a left turn as anything else in his brilliantly mercurial career thus far. But with songs like "Fast Horses & Good Hideouts" or the raucous "I'm Wild & My Woman Is Crazy," Jennings more than affirms his mission by returning to country's original, if oft misplaced, mandate: singing songs about growing up and getting older, about going out and getting trashed. In short, making music for real people with real lives. 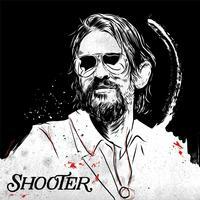 With Shooter, Jennings truly puts his own mark on country music, living up to his extraordinary birthright with unparalleled passion, experience, and heart.